"Proverbs, Book of: a collection of moral and philosophical maxims of a wide range of subjects presented in a poetic form. This book sets forth the philosophy of practical life. It is the sign to us that the Bible does not despise common sense and discretion. It impresses upon us in the most forcible manner the value of intelligence and prudence and of a good education. The whole strength of the Hebrew language and of the sacred authority of the book is thrown upon these homely truths. It deals, too, in that refined, discriminating, careful view of the finer shades of human character so often overlooked by theologians, but so necessary to any true estimate of human life" (Stanley's Jewish Church). As to the origin of this book, "it is probable that Solomon gathered and recast many proverbs which sprang from human experience in preceding ages and were floating past him on the tide of time, and that he also elaborated many new ones from the material of his own experience. Towards the close of the book, indeed, are preserved some of Solomon's own sayings that seem to have fallen from his lips in later life and been gathered by other hands" (Arnott's Laws from Heaven, etc.). 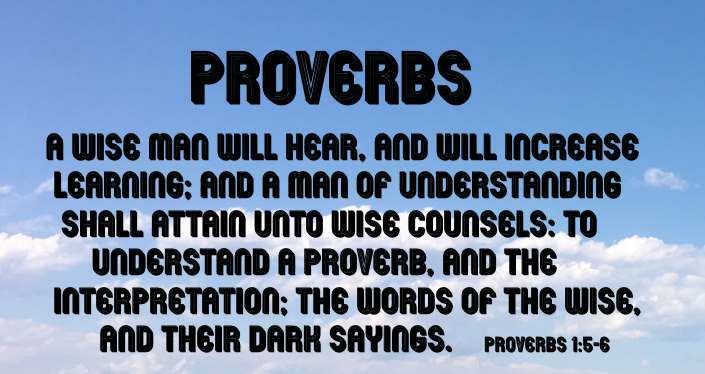 Consisting of Proverbs 1:1 - 9:18, which contain an exhibition of wisdom as the highest good. Consisting of Proverbs 10:1 - 24:34. Containing proverbs of Solomon "which the men of Hezekiah, the king of Judah, collected" (Proverbs 25:1 - 29:27). "The words of King Lemuel" (Proverbs 31:1-31). Solomon is said to have written three thousand proverbs, and those contained in this book may be a selection from these (1 Kings 4:32). In the New Testament there are thirty-five direct quotations from this book or allusions to it."